Unlike our April Fool’s satirical posting to raise awareness on the issue of FreshDirect and how their move can and will harm our communities if allowed to do so, this really did just happen. 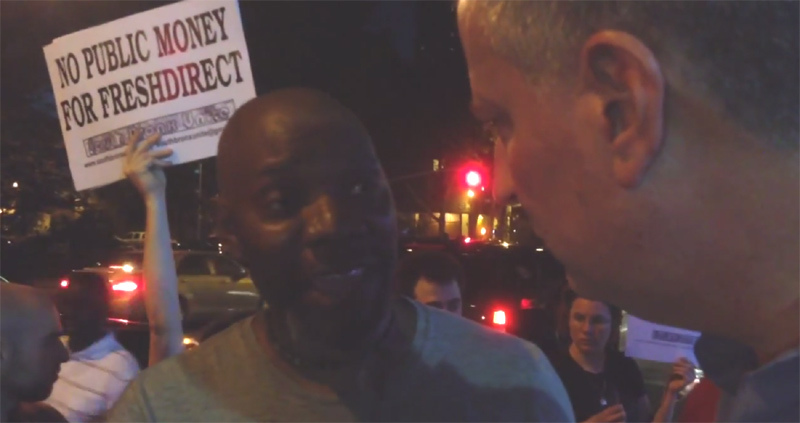 Around 8PM, while Mayor Bill de Blasio was visiting La Morada, a local restaurant in Mott Haven in an unannounced visit, a local resident quickly alerted South Bronx Unite members who within 10 minutes had gathered and mobilized with over 25 people including their children to protest against FreshDirect and de Blasio’s promise to end a tale of two cities—something which allowing FreshDirect to move into South Bronx will continue to perpetuate. “We still got to continue to fight even if you feel you can’t do anything about it we know contracts are made to be broken.” added Johnson. de Blasio asked “How can we get in touch with you,” and had already received contact information from several members of the group. Mychal Johnson told us that within minutes 2 dozen police officers and several vans from the 40th precinct arrived but immediately backed off as Mayor de Blasio continued to speak with the crowd. “We are here peacefully protesting as guaranteed by the constitution and we’re here with our children,” Johnson told he said to de Blasio. We’ll keep you posted on this breaking story as a meeting is officially set between the community and Mayor Bill de Blasio after 16 months since coming into office. This is a battle that has been going on almost 3 1/2 years and will continue until justice is done by the community and the mayor we elected sticks to his promises and does the best fight that he can to squash this deal once and for all. Mayor de Blasio had made ending FreshDirect deals and deals like it as part of his campaign promises during his 2013 campaign. Dear Bronx Borough President Ruben Diaz Jr: How Many More of Our Children Must Die From Asthma Before You Stop FreshDirect?